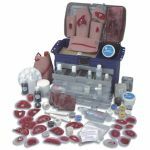 The Life/form Pericardiocentesis Simulator is designed specifically to teach the skills needed to perform this difficult procedure correctly, as well as ongoing chest tube maintenance and the management of pre-hospital chest trauma. The simulator has a pressurized tension pneumothorax site and a site for the surgical placement of a functional chest tube. Fluid color, volume, and viscosity can be controlled by the instructor. 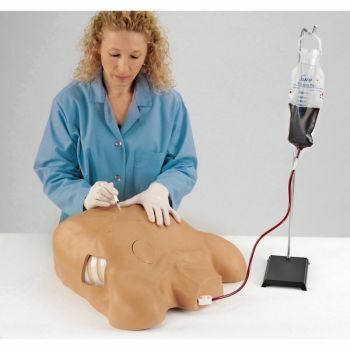 The manikin may be used with any commercially available closed water seal drainage unit. Pericardiocentesis may be performed in the left subxiphoid space and in the left fifth intercoastal space. Accurate placement of the needle will allow for the withdrawal of fluid from the simulated pericardium. 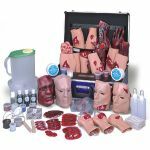 Includes fluid reservoir bag, foot pump, surgical skin pads, subcutaneous surgical pads, nurse training pads, pneumothorax pads, blood powder, methyl cellulose thickener, simulated pericardium, IV bag, and a hard carry case. Five-year warranty.